China plans to provide an unspecified financial "grant" to Pakistan while the United Arab Emirates is actively considering Islamabad's request for a fiscal relief package of up to $6 billion to help the country deal with a looming balance-of-payments crisis, Chinese and Pakistani officials say. News of the anticipated financial aid came days after Prime Minister Imran Khan secured more than $6 billion in immediate financial support from Pakistan's close ally, Saudi Arabia, during an official visit to Riyadh. FILE - Pakistani Prime Minister Imran Khan, surrounded by host country representatives and other participants, attends an investment conference in Riyadh, Saudi Arabia, Oct. 23, 2018. Pakistan urgently needs foreign currency to shore up its depleting reserves of less than $8 billion, which is barely enough for servicing its debt and paying import bills. Khan's nascent government, which took office two months ago and has inherited a debt-ridden national economy, estimates the country urgently needs about $12 billion to fulfill domestic and external liabilities. Khan is to travel to Beijing Nov. 2-5 on his first official visit to the country, where he is scheduled to meet President Xi Jinping and his Chinese counterpart. Chinese diplomats in Islamabad have announced ahead of Khan's visit that it will result in "good news" in terms of securing financial assistance for Pakistan. "During the visit of the prime minister, we will provide, hopefully, a grant to the Pakistani government. Please look forward to the outcome of this visit. There will be more good news to follow," said Deputy Chinese Ambassador Lijian Zhao, when asked whether Beijing would provide Khan financial assistance similar to the package the Saudis have pledged. He declined to speculate on the size of the grant. Under the Saudi deal, Riyadh will deposit $3 billion in the coming days with the central State Bank of Pakistan for one year, as balance-of-payments support. Additionally, Saudi Arabia will export oil to Islamabad worth more than $3 billion on a deferred-payment basis over the next three years. Khan's government has rejected reports of any conditions attached to the Saudi aid package. Federal Minister Haroon Sharif, chairman of the Board of Investment, said Saturday that the Pakistani government had formally submitted a financial request to a visiting UAE delegation similar to what Saudis have pledged. The Gulf state, he noted, is one of the biggest oil suppliers to Pakistan. The minister told local Dunya TV the UAE delegation “positively” noted the Pakistani request and has promised to return with possible options in the next few days. "It is expected to be a good package. I am unable to share the figures, but I think it would more or less be similar to the one Saudi Arabia has announced [for Pakistan]," said Sharif, who accompanied Khan during his visit to Saudi Arabia and will be part of the Pakistani delegation traveling to China. 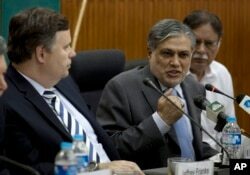 FILE - Then-Pakistani Finance Minister Muhammad Ishaq Dar, center, addresses a news conference with Jeffrey Franks, left, who then was the IMF mission chief for Pakistan, at the finance ministry in Islamabad, Pakistan, July 4, 2013. At the time, Pakistan and the IMF reached agreement on a bailout plan. In addition to pushing friendly countries to provide fiscal relief, Khan's government has also turned to the International Monetary Fund to seek a bailout package. Formal talks are scheduled to begin in Islamabad on Nov. 7. Pakistan has taken advantage of repeated IMF bailouts in the past several decades. 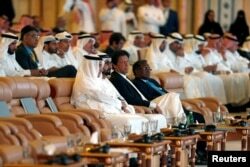 Analysts say the Saudi financial package and expected aid from both China and the UAE will most likely boost Pakistan's negotiating position and may mean the country will require a smaller IMF arrangement. During Khan's visit to Beijing, officials said the two countries would sign "many agreements" to boost trade and investment ties and launch the second phase of the China-Pakistan Economic Corridor (CPEC), which is the flagship of Xi's global Road and Belt Initiative. The two sides will sign a framework for launching industrial cooperation under CPEC and increasing Pakistani exports to China. The United States has persistently expressed concerns about the Chinese infrastructure and connectivity initiative, saying they are burdening partner nations like Pakistan with debt. The U.S. also criticized a lack of transparency about the terms of contracts under the infrastructure initiative and consequent effects on the economy, said Henry Ensher, acting deputy assistant secretary of state. He acknowledged in a speech in Washington this month the importance of China-led initiative. "But that role ought to be done, ought to be played in accordance with usual rules about the transparency and accountability so that people in countries that cooperate with China can see clearly what they are signing up for," Ensher said. U.S. officials have already cautioned the IMF about entering into an arrangement with Pakistan, citing CPEC loans as a main factor for the country's debt crisis and suspecting the IMF money would be used to pay back China. Islamabad and Beijing have vehemently rejected Washington's assertions as "misplaced" and "irrelevant." Both countries acknowledge Chinese loans under CPEC are just over 6 percent of Pakistan's total domestic and external debts of about $95 billion. FILE - In this photograph taken on Oct. 4, 2017, a Pakistani soldier stands guard near a ship carrying containers at Gwadar port. 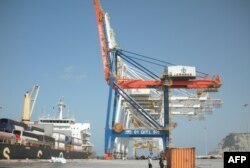 Since launching CPEC in 2013, China has invested $19 billion in Pakistan, building or upgrading its transportation network and power plants and putting into operation the key Arabian Sea port of Gwadar. The mega-project is expected to bring more than $62 billion to Pakistan in Chinese investment by 2030, ultimately linking Gwadar to the landlocked western Chinese region of Xinjiang and giving Beijing the shortest secure access to international markets. "We are building these projects totally based on mutual consultation and also mutual sharing. … Definitely, there is no private interest or unilateral interest from the Chinese side. We believe all the projects are mutually beneficial," Yao Jing, Beijing's ambassador to Islamabad, told reporters at the sprawling Chinese Embassy on Friday.